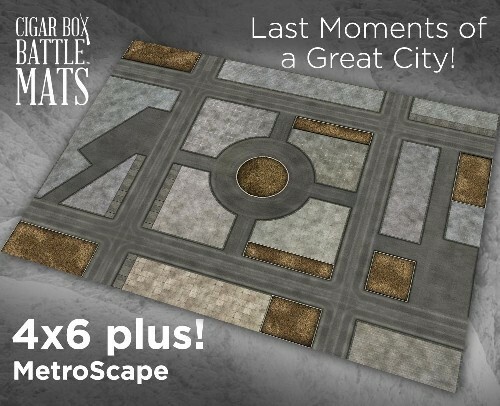 The MetroScape (#300) mat is a great looking and versatile terrain mat! It is professionally illustrated and perfect for just about any science fiction urban / alien combat game. Use this highly detailed mat with your favorite epic Sci-Fi rules and let your orbital bombardments, dropships, artillery, tanks, and infantry squads run wild! May victory be yours! This mat works for 6mm, 10mm, 15mm and 28mm figures. Just add your own figures, buildings, ruins, vehicles, parks, street lights, etc. and get ready for an epic gaming experience!